Android has some built in UI testing tools. These tools can be used for automated UI testing. However the tools are not so simple to use. This post is an attempt to set a guideline towards using these tools. This tool is a command line based tool that can be primarily used to stress test your application UI. It is the simplest tool to use. Here's how..
- Open a command console. - First direct your console to the location of the adb (Android Debug Bridge) program in the android sdk. Typically you can use the following command for this..
- Now make sure you device is connected with the application running on it or that the emulator is running the application. (replace -d with -e to test on the emulator. package_name is the name of the application package abnd it usually begins with com. Now you will see the monkey stress testing your app. in the console to generate the relevant logs. The monkey tool can also be used to run a specific set of commands on the application. However it is easier to use the monkeyrunner for this purpose. Now the following will be printed on cmd line..
you can write all instruction into a script (script.txt) as below.. The monkeyrunner tool is an API for writing automated UI tests. You can use it to write specific scripts that run a series of commands and inspects the output by taking screenshots etc. The android SDK includes two special scripts written using monkeyrunner which help in running automated UI tests. The scripts are.. Copy these scripts to /tools folder in the android sdk. Set the console path to the tools directory. Open up the application on the emulator. 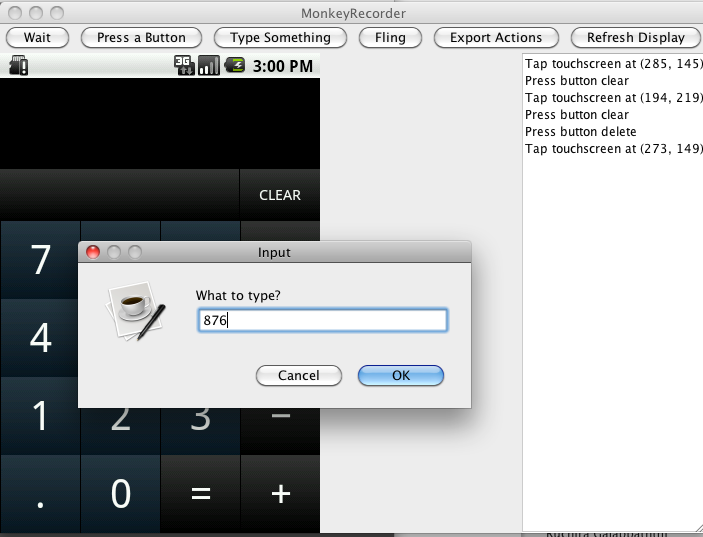 You can run the recorder as follows..
Below is a screenshot of monkey_recorder recording actions for calculator. For playback to run properly you need to take precautions of setting the correct wait times and using the correct press, fling, type methods in the recorder. Conclusion: Android has a good collection of tools meant to enable UI test automation. However they still have a lot more room for improvement especially in terms of ease of use and efficiency. Do we need to make any changes in the monkey_recorder.py file, Because when i run the command ./monkeyrunner monkey_recorder.py I'm getting a blank screen. by blank screen do you mean the monkey recorder application opens but doesn't display the android screen inside it? this happens when the emulator is not running. recording doesn't work for a connected device so you need to have the android emulator running. Yes, the application opens but doesn't display the android screen. And I am running the emulator. Even though its the same blank screen. if your device is also connected at the time you are running the emulator monkeyrunner may be detecting your device instead of your emulator. monkey_recorder.py cannot read and display the screen of your device. disconnecting the device and having the emulator run should work. Im also having the same problem,my emulator is running,no other device is connected.But when i run monkey_recorder.py its opening a blank screen,not the emulator that was opened. The actions like clicks are getting to the emulator though. I like your blog technique.This is one of the great post.I like your blog out standing performance.By read your post I came to know Android has to Build some UI tools.This is one of the specific post. Sorry, didn't notice the dead links. Just updated them..
Shall we run the monkey tool at a time on two command prompts???? I mean type and run monkey commands one after the another on command prompt immediatly??? which command prompt events are generated and applied to emulator??? Can u plz clarify dis?? Can you please explain how these scripts are directly in the monkey exerciser. sorry i'm not clear with what you are asking. can you explain what you are trying to do? 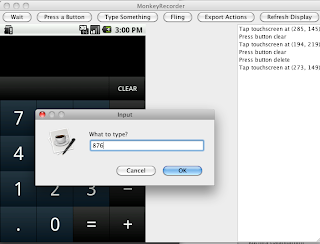 the monnkeyrunner program is in the tools folder of android sdk. Download the monkey_recorder.py and monkey_playback.py scripts above and copy them into the same tools folder where monkeyrunner is. Then you can change to the tools directory in terminal and call the following commands ..
if you keep the scripts in a separate folder you can call them using the full file path name. is showing an error "Error binding to network socket." I am running into same error as Sam mentioned above, Wondering how did you resolve the issue? I tried by following the steps, but it never works, my PC is not able to telnet to my device, any idea? If my device and PC are under the same WiFi access point, it should be possible to telnet from my PC to the monkey on my device through the network without having to set port forwarding? You need to reset the application position on the emulator/device to the point where you started the recording, before calling the ./monkeyrunner monkey_playback.py "script_name" command. This way you can playback the recorded commands from the beginning. Can you explain, how to reboot offline android phone using monkey tool or monkeyrunner tool ? Reboot is not possible using adb, monkey or monkeyrunner. you can use this command to reboot your device, it worked for me. 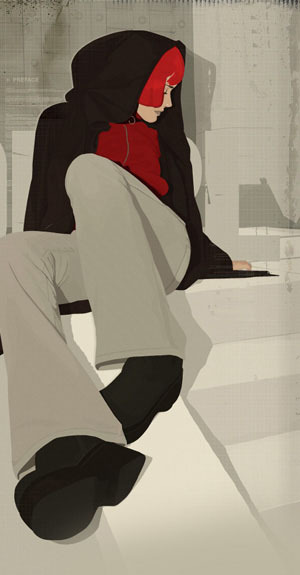 Awesome blog really helpful lot for me .. Thanks for sharing knowledge. very help full me and save lot of time. it worked for me.All the best. I followed steps for using monkey. Wats the reason for 'Connection closed by foreign host'? Hii, how to get the time in monkey logs? I run monkeyrunner monkey_recorder.py ok.
Now i want to see show visual feedback for touches. My mean when i touch on emulator i will see feedback for touches on real device. I checked into "show touches" and "pointer location" on real device. NEED to help. When am executing the monkey recorder script with the below mentioned command am getting error. if still it doesn't work, then use ./monkeyrunner monkey_recorder.py as we use in Linux/Unix based OS. Great post, thank you very much, please write more and more about this. Very interesting and understand.Fell in love with you. I am learning Monkeyrunner and i need some clarification regarding this tool. For any particular monkeyrunner script how can i decide whether test is Pass or Fail. A very helpful post. Thanks for sharing. Cheers! Thank you for posting this informative post. It is really useful.